This festive display of fall-themed glassware caught my eye at a recent Annex Flea and drew me to it like a moth to a flame. Sonja Stefanovic of Woo Hoo Decor has a great eye and finds some really cool things that she then passes on to the public (at great prices – the two orange dishes at the lower right were $15 each) at local flea markets. Any of these pieces would look great on a Thanksgiving Day table. 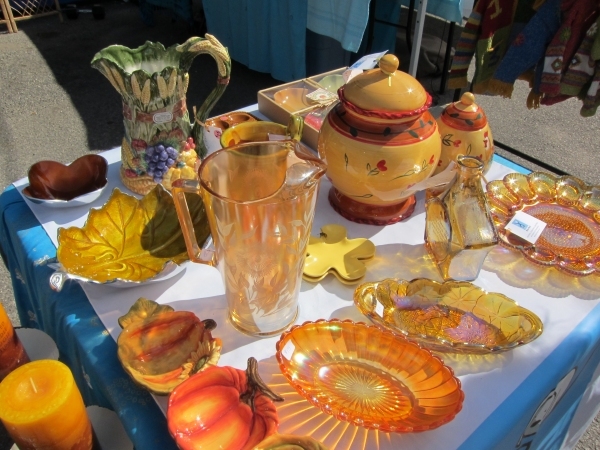 Merchandise changes regularly, and Sonja vends at many local flea market events. Visit her at the upcoming Leslieville Flea (October 19, Ashbridge Estate, 1444 Queen Street East and November 30th, SH Armstrong Community Recreation Centre, 56 Woodfield Road ), Annex Flea (November 6th, December 13th & 14th, Centre for Social Innovation, 720 Bathurst Street) or Habitat for Humanity Durham Christmas Showcase at All Saints High School 3001 Country Lane, Whitby, December 6th & 7th.